Beyond the backyard, I could not wait to forage for elderflower (or hyldeblomst) when it bloomed in spring. The fragrant white blossoms were EVERYWHERE! They spilled out onto the sidewalks, grew next to the train tracks, and stood proudly in a quiet park. 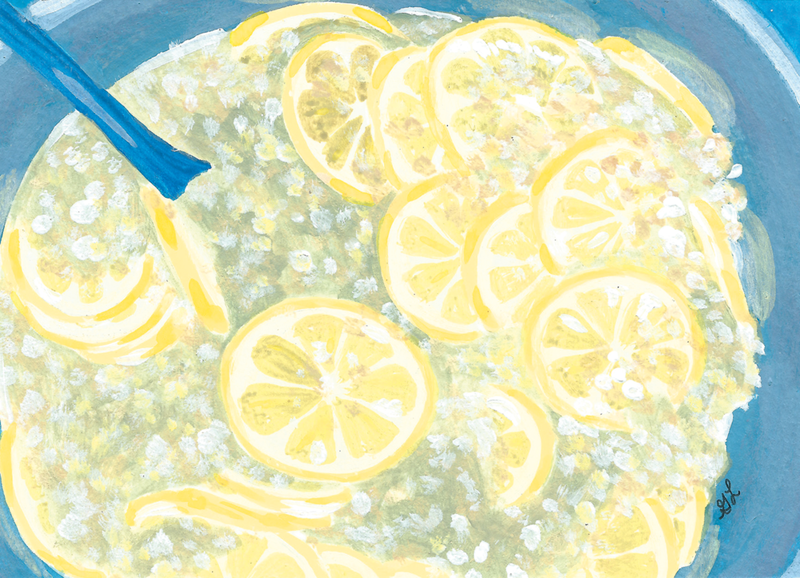 To capture this magical time, we made a big batch of elderflower cordial to brighten drinks all year ‘round. Learning about wild Danish foods prompted learning about food in the U.S., too. Take chamomile, for example. On a foraging tour, we ate it straight from the ground. There was so much flavor! It tasted of anise, sweet and strong. This whole time, I’d kept chamomile inside the “tea” category, but it took a move across an ocean for me to realize it can be so much more. Starting in June with cherries, the fruit trees around here popped. For a long while, I just walked by the fruit-heavy branches, as they always seemed to high or time seemed too short. But now I've decided to ‘go for it,’ and now I’m stopping at every cherry, plum, fig, and apple tree I see. It’s a pleasure to notice the orchards we walk among on a daily basis. There is something so liberating and primal about plucking food directly from where it grows and eating it on the spot. The act peels away the complexity of our modern food system and leaves one with the simple feeling of being fed directly by nature. I hope the next time you spot something edible in the public domain, you will ‘go for it,’ too.